In my twenties, I gained a lot of weight from these foods and from processed foods like candy bars and ice cream. Although I lost weight before going plant based, I was flexitarian (occasional animal products each week). I also started to eat lots of fruits and vegetables when I started to lose the weight. This set the stage for my plant based eating. Do I ever plan on going back to eating animal products, you might ask? No, because for one thing I feel great. But another reason is my compassion increased since going plant based (I might as well say I'm vegan too) as I could never imagine harming an axial for food or clothing. To think, I never gave animal welfare a thought when I ate them, but now, after watching videos on what factory farming is like... I'm so glad I'm not eating those foods. Here's a recent picture to show my progress with the muscle building since going plant based. 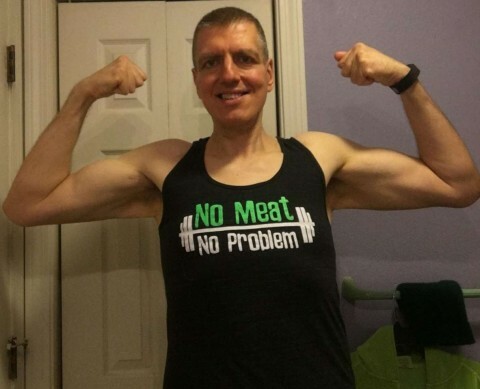 I never grew as much muscle when eating animal products. I guess there really is enough protein in plants! Shred It! Challenge Week 9 Update ... No Meat, No Problem!